Attack surface reduction rules help prevent actions and apps that malware often uses to infect computers. 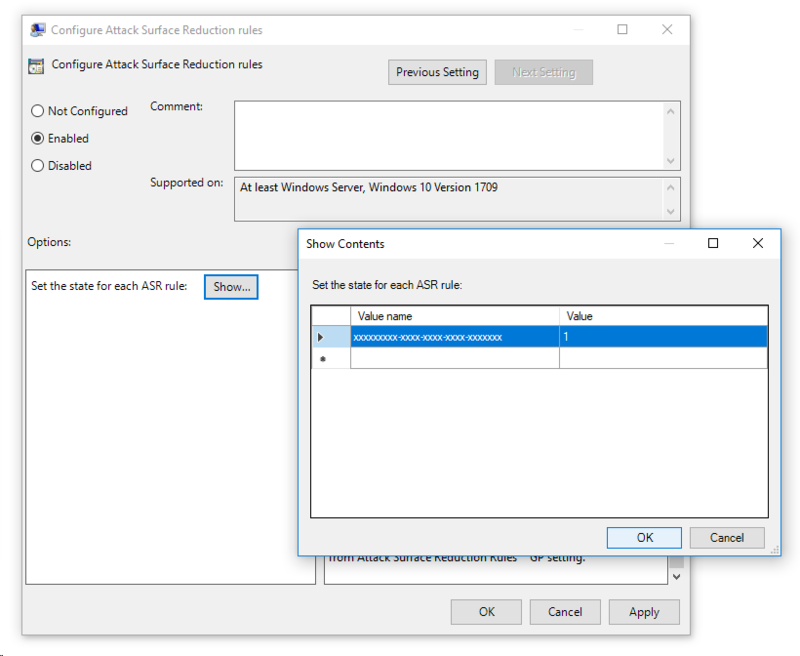 You can set attack surface reduction rules for computers running Windows 10 or Windows Server 2019. To use ASR rules, you need either a Windows 10 Enterprise E3 or E5 license. We recommend an E5 license so you can take advantage of the advanced monitoring and reporting capabilities available in Windows Defender Advanced Threat Protection (Windows Defender ATP). These advanced capabilities aren't available with an E3 license, but you can develop your own monitoring and reporting tools to use in conjunction with ASR rules. You can exclude files and folders from being evaluated by most attack surface reduction rules. This means that even if an ASR rule determines the file or folder contains malicious behavior, it will not block the file from running. This could potentially allow unsafe files to run and infect your devices. Excluding files or folders can severely reduce the protection provided by ASR rules. Excluded files will be allowed to run, and no report or event will be recorded. If ASR rules are detecting files that you believe shouldn't be detected, you should use audit mode first to test the rule. You can specify individual files or folders (using folder paths or fully qualified resource names) but you can't specify which rules the exclusions apply to. The rule Block executable files from running unless they meet a prevalence, age, or trusted list criterion with GUID 01443614-cd74-433a-b99e-2ecdc07bfc25 is owned by Microsoft and is not specified by admins. It uses cloud-delivered protection to update its trusted list regularly. ASR rules support environment variables and wildcards. For information about using wildcards, see Use wildcards in the file name and folder path or extension exclusion lists. The following procedures for enabling ASR rules include instructions for how to exclude files and folders. It's best to use an enterprise-level management platform like Intune or System Center Configuration Manager (SCCM) to configure ASR rules, but you can also use Group Policy, PowerShell, or third-party mobile device management (MDM) CSPs. If you manage your computers and devices with Intune, SCCM, or other enterprise-level management platform, the management software will overwrite any conflicting Group Policy or PowerShell settings on startup. For a complete list of ASR rules, see Reduce attack surfaces with attack surface reduction rules. For further details on how audit mode works and when to use it, see Audit Windows Defender Exploit Guard. In Intune, select Device configuration > Profiles. Choose an existing endpoint protection profile or create a new one. To create a new one, select Create profile and enter information for this profile. For Profile type, select Endpoint protection. If you've chosen an existing profile, select Properties and then select Settings. In the Endpoint protection pane, select Windows Defender Exploit Guard, then select Attack Surface Reduction. Select the desired setting for each ASR rule. Select OK on the three configuration panes and then select Create if you're creating a new endpoint protection file or Save if you're editing an existing one. For information about enabling ASR rules and setting exclusions in SCCM, see Create and deploy an Exploit Guard policy. If you manage your computers and devices with Intune, SCCM, or other enterprise-level management platform, the management software will overwrite any conflicting Group Policy settings on startup. Expand the tree to Windows components > Windows Defender Antivirus > Windows Defender Exploit Guard > Attack surface reduction. To exclude files and folders from ASR rules, select the Exclude files and paths from Attack surface reduction rules setting and set the option to Enabled. Click Show and enter each file or folder in the Value name column. Enter 0 in the Value column for each item. If you manage your computers and devices with Intune, SCCM, or other enterprise-level management platform, the management software will overwrite any conflicting PowerShell settings on startup. You must specify the state individually for each rule, but you can combine rules and states in a comma-separated list. You can also the Add-MpPreference PowerShell verb to add new rules to the existing list. Continue to use Add-MpPreference -AttackSurfaceReductionOnlyExclusions to add more files and folders to the list. Use the ./Vendor/MSFT/Policy/Config/Defender/AttackSurfaceReductionRules configuration service provider (CSP) to individually enable and set the mode for each rule. The following is a sample for reference, using GUID values for ASR rules. Use the ./Vendor/MSFT/Policy/Config/Defender/AttackSurfaceReductionOnlyExclusions configuration service provider (CSP) to add exclusions. Be sure to enter OMA-URI values without spaces.